Do you prefer calculators with big, easy-to-read, easy-to-punch buttons? If so, you'll want Day Maxi Calc (free), a calculator with buttons so big you'll be able to see them from several feet away. That's not the only reason to give it a try, though, because it has several other useful features, including the ability to save your calculation history to a text file. Day Maxi Calc features big, fat buttons for doing calculations. There's more as well. 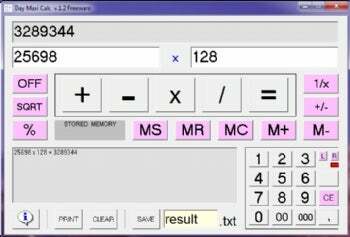 Day Maxi Calc lists a history of your calculations, emulating an old-fashioned manual calculator that uses tape. There are also time-saving double-zero and triple-zero keys, as well as a square root key.